Trailing Stop Loss - What Does It Mean? What is a trailing stop loss? 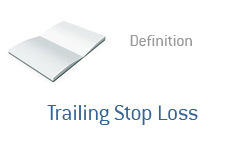 What is the definition of a trailing stop loss? Before we define the term "trailing stop loss", let's quickly explain what a stop loss is. Let's say that you buy a stock at $10. Let's say that you want to limit your losses - if the stock trades at $9 or below, then you will sell. You can put in a stop loss at $9, and your trading software will execute your sell order if the stock trades down to $9. This is a stop loss. A trailing stop loss is different. Rather than setting a hard stop loss based on a particular price, you would be setting a stop based on how far a stock declines from its peak. Let's explain. Let's say that you buy 1000 shares of XYZ at $10, and you decide to implement a trailing stop of $0.50. If the stock immediate trades down to $9.50, then your sell order will be executed. However, let's say that the stock immediately trades up to $12. Your trailing stop would mean that if the stock traded back down to $11.50, then your sell order would be executed. The trailing stop loss trails the price of the stock, and executes based on whether or not the stock falls a certain % (or $ figure) from its peak. So, if you buy a stock at $100 and set a trailing stop of $5, and the stock immediately trades up to $200 and then back down to $190, then your trailing stop loss order would have been executed at $195.